Sofia Smallstorm is best known for her research on 9/11, which culminated in the documentary 9/11 Mysteries. She is also known for her analysis of chemtrails. We’ll discuss the tools being used to create humanity 2.0. It would appear there is an agenda to synthetically re-engineer humanity, both physically and mentally. We’ll talk about what some of these aspects the elite would find useful to change may be and how it can be done. How far might this go? Sofia talks about the attributes that seem to be emerging in humanity 2.0. Also, we discuss the secular humanist, transhumanist movement or techno-progressivism that seeks to make man superior but “equal” across the globe. As Earthlings are bombarded with an onslaught of synthetic elements, we’ll discuss how we can remain relatively untouched. Will we see a separation between humanity 1.0 and humanity 2.0? Will we be able to reverse the damage that may occur? Google is in the early stages of creating tiny, magnetic nanoparticles that will be able to search the human body for cancer and other diseases, The Wall Street Journal’s Alistair Barr and Ron Winslow report. Google’s goal is “an early heads-up” on disease to ultimately facilitate more effective treatment by making medicine proactive instead of reactive. Google’s particles will be less than 1/000 the width of a red blood cell and will attach themselves to specific cells, proteins, and other molecules inside the body, depending on what they’re “decorated” with. For example, Google could coat its nanoparticles with a specific antibody that would recognize and attach to a protein on the surface of a tumor cell. Google is also working on a small wearable device that would attract and count the particles. In that way, the system would be used for testing and monitoring health: You could be alerted through the wearable if a lot of the particles were attaching to tumor cells. Google admits, however, that it still needs to better understand what constitutes as a healthy level of disease-carrying molecules in the blood and what would be a cause for a concern (Google’s “Baseline Study” is already trying to define what a healthy human looks like). The idea is that people would be constantly monitoring their bodies, so they wouldn’t wait until they felt physically sick to go to the doctor. Google would likely let people consume its nanoparticles through a pill, but is reportedly at least five to seven years away from a product that would be approved by doctors. Conrad told The Wall Street Journal that Google would not collect or store any medical data itself, but would license the technology out. “We’re going to be inventors that work on the technology— disruptive, innovative technology—and then we’re going to look for partners who will bring it forward,” Conrad told Backchannel’s Steven Levy. More than 100 Googlers — with backgrounds including chemistry, astrophysics, and electrical engineering — are working on this nanoparticle project. The company is also collaborating with MIT, Stanford, and Duke. Nanotechnology is probably not the reading material sitting on the coffee tables of most people. Yet, it is already beginning to have an impact on everything from electronics to alternative energy to food, cosmetics and clothing. In fact, several hundred common products contain nanomaterials, which has prompted lawsuits against the FDA for failure to properly regulate them. 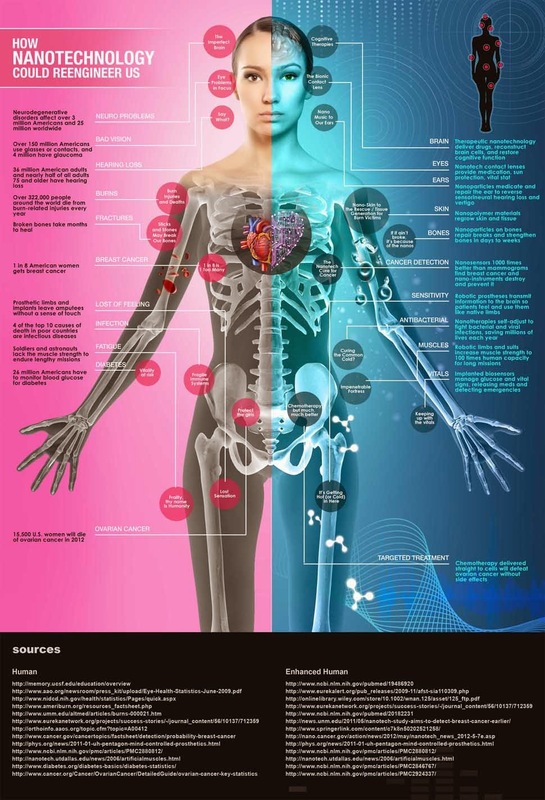 For futurists and Transhumanists, the human body is the final frontier. The nanotech revolution has been heavily invested in by the U.S. government, as outlined in their National Nanotechnology Initiative Strategic Plan, which involves 20 federal agencies and partners. This must-read document lays out a projected future to understand and control matter for the management of every facet of the environment, health and safety. We are beginning to see the dividends being paid to Big Pharma through edible nano-sized microchips and other “smart” pills aimed to surveil the internal workings of the body, and one day perhaps completely reengineer humanity from the atomic level on up … including the brain. The infographic below offers a comprehensive overview of how this reengineering will take shape. Now is the time to start paying close attention to these developments, as what has been considered to be science fiction conspiracy theory thus far is now being openly discussed on the world stage as Humans 2.0.